If you count yourself to the species of people who have a hard time understanding the appeal of porridge and to see charisma in baked oats recipes, hey I’m with you, I completely understand what you are going through, I once was on the dark side your side. Once. Until now. Problem being, I can’t rationalize or even remotely have a logical explanation for what made me head back to the kitchen late last evening after stumbling upon Macheesmo’s recipe. Believe me, I’m not the type of girl who is easily impressed by the words oats or oatmeal, quite the contrary. Maybe reading the recipe has put a spell on me? Let me be upfront and 100 % honest: I doubt, this recipe is a crowd-pleaser, I really do! And yet this true gem has made my rainy Monday morning a little brighter, my future breakfast repertoire so much more substantial – I simply can not NOT share it with you. So there. It brings out the very best of rolled oats, sweet chewiness meets nutty flavor, hot meets cold and it is impossible to stop, once you allow yourself the thought of being in love with a bowl of baked oatmeal. There is no way back. Start preparing your oats the evening before you plan to serve them: I used a larger bowl with a lid, it allows me to comfortably mix all ingredients and keep them in an airtight container in the fridge without having to change dishes. Melt the butter over low heat, then remove from the stove and let cool down a bit. Break the egg into the bowl and beat with a whisk, then add the sugar, the butter, the baking powder and the spices and blend well. Lastly pour in the milk and add the oats with a wooden spoon until everything is combined. Close the bowl with the lid and let soak over night in the fridge. Baking the oats: Preheat your oven to 180°C (350° Fahrenheit). Generously grease a gratin dish or other ovenproof dish with butter. 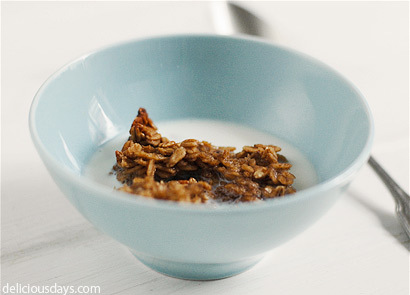 Pour the soaked oats into the dish and flatten them with the back of a spoon. Bake on middle level for ~40 minutes or until the top gained a nice golden brown color and the oats feel crisp to the touch (be careful – don’t burn yourself!). Take out of the oven and serve with warm or cold milk – I prefer it cold, it gives a nice contrast and turns lukewarm while you enjoy it. Of course you can add fruits or nuts, but I like its nutty chewiness best plain, as-is. My husband eats oatmeal every morning. This sounds like a great new recipe that even my kids would like. Thanks for sharing. So lovely! Thanks for giving it a shot. :) Glad you liked it as much as I did! How can you go wrong with butter, brown sugar, cinnamon, vanilla, and nutmeg, really? Looks like a delicious breakfast! Leider hab ich keine Haferflocken mehr im Haus, sonst hätt ich mich sofort ran gemacht. So muss das Rezept bis Morgen warten - aber garantiert nicht länger! This is very interesting because I dislike oatmeal as a general rule but do like baked oats... and I have been looking to change up my morning breakfast options. Maybe it's the fact that they're baked and not mushy that redeems them? For some reason this is incredibly nostalgic to me. I'm not sure why because though we ate a lot of oatmeal growing up I'm not sure we ever ate it quite like that. Wow, the recipe is so simple, yet appealing. Great pictures by the way! Definitely will try this some time. Tried it this morning. I took coarse grind oat instead of the rolled oats and substituted the sugar for honey - delicious. Can imagine that it also works perfect with millet. This will be one of my favourite breakfasts as from now - especially in winter. The kids like baked oatmeal, but I never felt the texture was quite right. Maybe I'll give this recipe a try. The pictures - as always - are gorgeous. what a concept! I never though of baking oatmeal, but it seems as if this would be much like a granola bar in flavour! I'll have to try it with the kids. thanks for the inspiration! This sounds so nice. It's winter here in Australia so the perfect time of year for this kind of breakfast. I just stumbled upon this rhubarb version. You might like to give it a try as well. 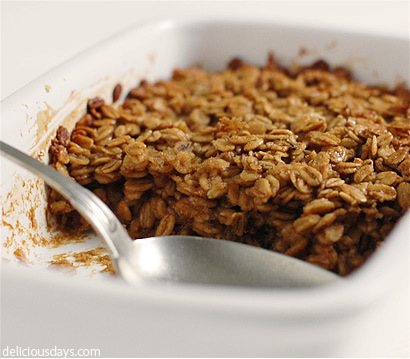 I absolutely LOVE baked oatmal. My favorite is similar to this, but has fruit and lots of nuts. Topped with vanilla yogurt, it's divine! The picture are great too. 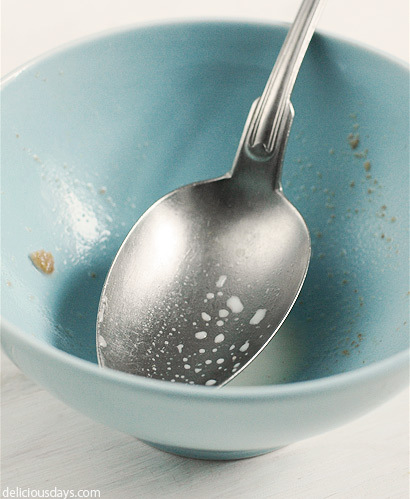 My parents used to eat oatmeal almost every morning for breakfast when I was a kid. Never did understand it. About as close as I can get is Rice Krispies. I will say that your recipe does LOOK good. I will probably just admire the picture though and stick with an omelette. Why did you even hesitate to post this recipe? The best recipes are the most basic ones! Love this breakfast option! Made this for breakfast on Saturday and it's a keeper. Thanks for sharing! I've made this wonderful recipe four times since you posted it...husband and I can't get enough. A few fun variations we've been trying are to bake with fruit already mixed in (such as blueberries/ cranberries/ etc). Das baked oatmeal steht seitdem jede Woche bei uns auf dem Tisch - übrigens auch sehr gut mit ein paar Kokosflocken! 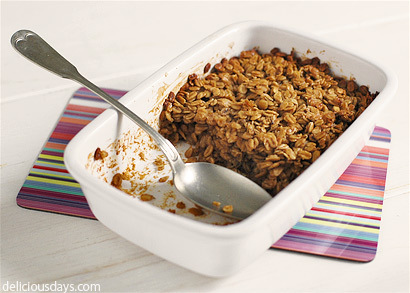 Found your recipe for baked oatmeal on tastespotting. I am confused by the recipe. It lists baking powder, then also lists baking soda. However, you did not specify how much baking soda to use. Could you please clarify this for me? I love oatmeal. Hi Darlene, Neither mine nor Macheesmo's recipe uses any baking soda - maybe you mixed it up with another recipe (mine is not on Tastespotting)? Dieses Gericht wird es jetzt bestimmt öfter mal bei uns geben! Nein, in allen Supermärkten ist er leider nicht erhältlich. Dafür hatte ich schön oft in Asia-Läden Glück. I tried the recipe this morning. It was so delicious! Although, due to the circumstances, I had to change it a bit (too late to prepare anything last night- so no soaking over night, not enough milk left - replaced it by cream with water, forgot the nutmeg). Anyway, in the end, I enjoyed it with cold milk, my boyfriend with yoghurt and we both added some apple sauce. Thank you for the recipe. P.S. : I remember seeing Muscovado in Germany in an "Eine-Welt-Laden". "Vollrohrzucker", which can be found in drugstores, comes quite close to it, I think.